Teasdale, our great horned owl, perched upon a medium-sized glove. We are often asked about the interesting gloves that we wear when handling our birds. While most people instantly see why we wear them, some just can’t help but be fascinated by the gear. So, here’s a little information for any of you who have been wondering about one of the most important pieces of equipment we use every single day. 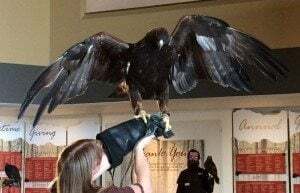 Leather gloves are used by raptor handlers including falconers, rehabilitators, zoo personnel, and those working in various types of raptor shows. 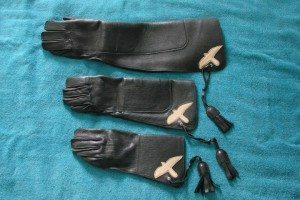 These gloves are used by handlers to turn the arm into a suitable perching surface for the bird while protecting the handler from the sharp talons of that bird. Sometimes called gauntlets, falcon gloves, or hawking gloves, these are an important piece of equipment. 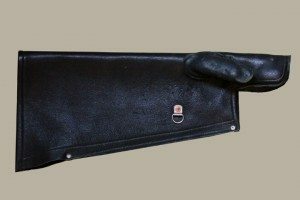 Raptor gloves are made of strong leather and come in a variety of colors, sizes, and thicknesses. The Greater Yellowstone Raptor Experience provides some universal sizes that volunteers may use, or we can purchase our own, which is what many of us have done. The advantage of purchasing our own gloves is that we can have them custom made to fit our hand. Our gloves are constructed by hand at “Traditions Glove.” With our first order we send a tracing of our hand to Traditions along with a palm measurement. Our measurement information is then kept on file, so that we can purchase additional gloves in the future if we wish. The gloves are made of different thicknesses and lengths depending on what type of birds will be handled. It’s important to use the right sized glove as the glove not only protects us, but it is also the gloved hand that we will mainly control the bird with. Each glove has a D-ring where the birds’ leash is tied on for safety and an optional tassel which allows you to hang the glove for storage. 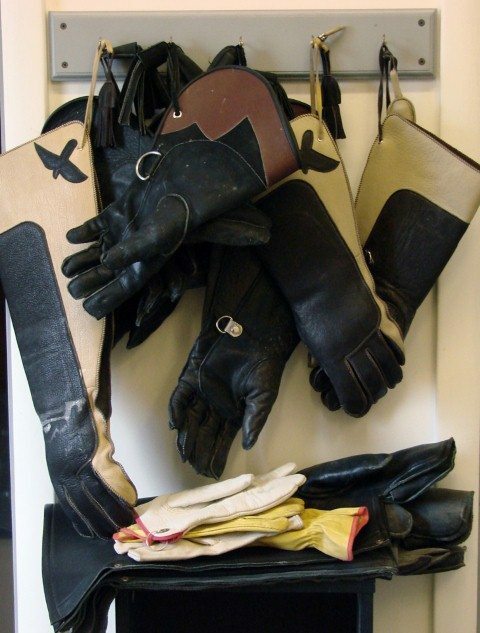 Gloves can be a very expensive tool, costing up to $200 each. The smaller glove that you see in the photo above is used for peregrine and smaller falcons, and small owls. This glove covers the hand and wrist and is constructed with a single layer of a lighter hide. This is my favorite glove as it is very comfortable to wear and gives me good hand control. I use it when I am handling Hayabusa, our peregrine falcon, and Salem, our kestrel. 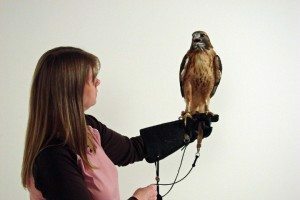 The medium-sized glove is designed to be used with large owls and hawks such as our red-tailed hawk and great horned owl. This glove is 15 inches long and comes almost up to my elbow. 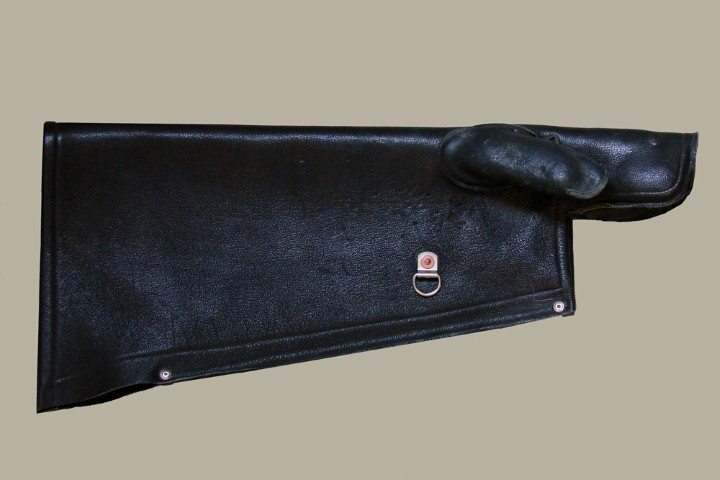 It is made of a double layer of leather on the cuff, thumb, first three fingers, and the bird perching area. 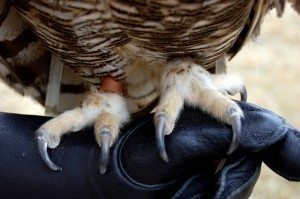 Though not as comfortable to wear as the smaller glove, it can also be used with smaller birds such as our peregrine falcon. The large glove is good for eagles and large birds with a wide stance such as vultures. This glove is constructed similarly to the medium sized glove but has triple thickness on the thumb, first finger, and bird perching area. This glove is around 21 inches in length so that it reaches farther up the arm and over the elbow area. I wear this glove when working with Suli, our turkey vulture. Like the anklets worn around a bird’s legs, the gloves we wear every day are important pieces of equipment for our jobs. When you handle birds that are designed to kill their prey with their feet, the last thing you want is the wrong glove for the job! Anne Hay has a Bachelor's degree in Elementary Education and a Master's in Computers in Education. 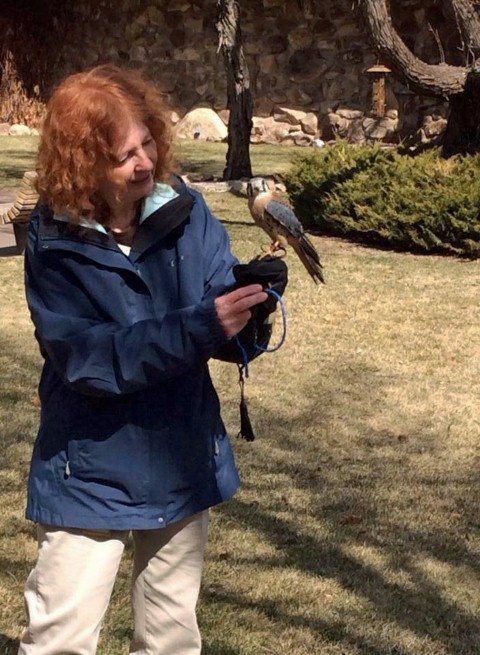 She spent most of her working years teaching third grade at Livingston School in Cody, Wyoming. After retiring she began doing a variety of volunteer work for the Buffalo Bill Center of the West’s Draper Natural History Museum. Anne loves nature and has a concern for the environment. She believes that educating the public, so that they will have a better understanding and appreciation for the natural world, is very important. Because of this belief, volunteering at the Center is a perfect fit. She spends time in the Draper Lab, observing eagle nests for Dr. Charles Preston’s long-term research project on nesting golden eagles, writing observation reports of raptor sightings in the Bighorn Basin, and working with the Draper Museum Raptor Experience.